A proposed “no kill” policy for brumbies in Australia’s Kosciuszko National Park appears more compassionate, but it may ultimately and unintentionally be crueller, suggest Andrea Harvey, of the University of Technology in Sydney; Carolynne Joone, of James Cook University, and Jordan Hampton, of Murdoch University. Immunocontraception has been successfully used only in smaller and more isolated populations (such as islands). Population modelling has estimated that more than 50% of mares would need to be treated in Kosciuszko National Park (KNP) just to slow the rate of population increase within 2–5 years. There is no vehicle access to many parts of KNP where horses live, and long treks across challenging terrain would make attempts to locate all horses very labour-intensive. Furthermore, many areas of KNP are completely inaccessible in winter because of to snow, making darting before the spring breeding season even more problematic. What would we be vaccinating horses with? Andrea Harvey, Veterinary Specialist, PhD scholar (wild horse ecology & welfare), University of Technology Sydney; Carolynne Joone, James Cook University, and Jordan Hampton, Adjunct Lecturer, Murdoch University. It is published under a Creative Commons License. While I appreciate the valuable professional information which this article provides, I believe that it commits a serious error in jumping to conclusions concerning the arbitrary assertion that naturally living horses will inevitably overpopulate, ruin their habitat, and then consequently starve to death. The authors assume that the horses will merely continue to reproduce and that no limiting factors other than starvation will come into play. The article shows a few pictures of thin brumbies that are expected, I suppose, to sway readers into a reactionary mode and get them on board for the brumby shooting option that has been proposed. This lopsided approach is very tendentious and overlooks the brumbies’ greater history as well as role in the natural world. Back in October 2014 I travelled to Australia and visited several brumby-containing ecosystems throughout this marvellous country and continent, including the Snowy River and Kosciuszko National Park region, where I was guided both by brumby defenders and by park biologists. 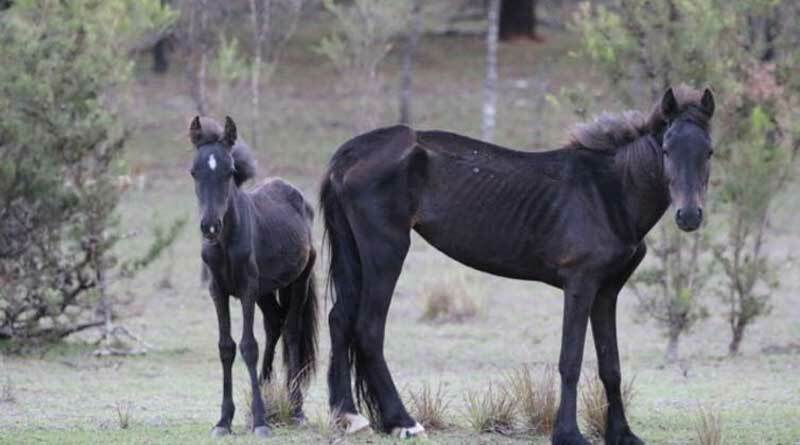 The vast majority of the brumbies I saw — and I saw 100’s all totaled — were in excellent condition and I did not notice any extreme degradation of the ecosystems in question. There were some disturbances around certain areas where the horses came into drink, but not excessive. And there were Corroboree frogs nesting here that did not seem to be overly affected. I presented a poster at the annual conference of the Ecological Society of Australia when I was here and highlighted the many ecological services that naturally living horses contribute, one of the chief of which is catastrophic wildfire prevention. And this is something that Australia should be particularly keen about given its increasing wildfires that are being exacerbated by Global Warming. And the same observation applies here in the western U.S. as well as in many other places. Before closing, I would like to remind the reader that I am in favor of preserving the unique species of animals and plants that have evolved over many millions of years in relative isolation upon the unique and amazing Australian continent. Measures should be taken to preserve these wherever possible. But since 1788 when the first European colonization began, there have been immense changes introduced into this ecosystem, many concern the promotion of cattle and sheep raising and other agricultural interventions. As in so many other parts of the world, horses were one of the mainstays of this colonization. But with the advent of tractors and automobiles, the horses found themselves displaced. Some escaped to freedom and following their age-old instincts sought to survive and to perpetuate their kind, as do we humans as well, by the way. Somehow it strikes me as uncharitable in the extreme to treat these highly evolved, sensitive and intelligent, basically generous and good-willed beings in horse form, who have done so much for us, as mere objects to be discarded. We humans have a natural affinity with these highly evolved presences, and they deserve our just respect and consideration. They should not become mere targets, blamed for all kinds of things simply because they are large and attention-attracting animals. They should not be set up for a cruel and heartless elimination program that is intellectually biased because it fails to consider the horses as well as Life’s greater past history, interrelated community, and evolving future. I would be glad to allow for the publication of my poster on the brumbies, which, in addition to illustrations, contains a written list of positive points about these animals that apply in many places, including in Australia. One of the chief of these concerns the fact that horses are not Ruminant-digesting herbivores like most of the herbivores promoted by modern society such as cattle, sheep and deer, but rather equids are Post-gastric-digesting herbivores. This is a major consideration and substantiates the horses’ greater contribution to the greatly enriching humus content of soils, and to their dispersing of more intact seeds and of a greater variety of species in intact condition and capable of germinating. This can greatly help many of Australia’s native plants and animals as adjustments between all these species evolve naturally, not just according to some narrow-minded and hard-hearted preconception of what species belong and what don’t. It is my hypothesis that the brumbies have much more that is positive to contribute to Australia than negative, that they are restorers of balance in many of the vast areas such as the Outback that have been overwhelmed by Ruminant herbivores brought in by modern man. And by the way, they do have natural predators here, such as the Dingos as well as such animals along the coasts and river inlets as Salt Water Crocodiles. I believe that we should let Nature show us what the New Harmony in the Life Community can become. We humans should pull in our horns and learn to appreciate the Whole of Life from a Higher Plane of Understanding, one that is much more spiritual in its recognition of that great transcendent Essence that all conscious beings not only Share, but ARE!